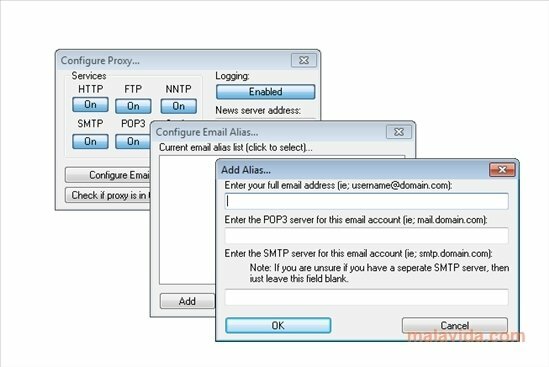 AnalogX Proxy is a program that acts as if it were a server, with the objective of making it possible to access the Internet from any computer connected to a local network, by means of a single PC. To be able to use, it's necessary to install the application on the computer that has the Internet connection and configure the rest of machines so that they access the rest of networks by means of a proxy network, something that is somewhat complex to start off, because it requires a certain amount of knowledge about networks. The program supports the vast majority of protocols: HTTP, HTTPS, SMTP, POP3 or FTP, and due to its simplicity it won't be difficult to use it to be able to have a connection from several instant messaging, mail managers or browser applications. The interface is very simple, due to the fact that in the main window you'll only have an area from which you will be able to select the protocols that you want to activate. Discover the easiest way to install a proxy on your computer with AnalogX Proxy.